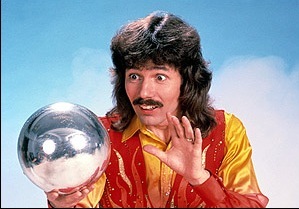 It's been 12 years since Doug Henning passed away. 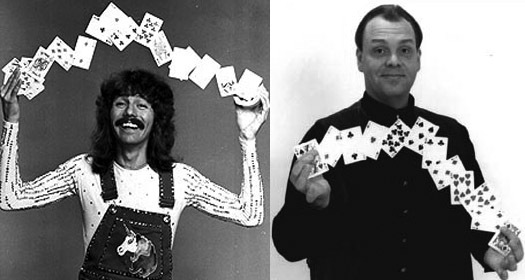 If you're a younger reader to my blog, you might not be totally aware who Doug Henning was. He is credited with bringing about a rebirth of interest in magic in the 1970s. His MAGIC SHOW on Broadway was a big hit and it was quickly followed by several years of annual 'Doug Henning's World of Magic' TV Specials on NBC. He was only 52 years old when he died on Feb 7th, 2000, the same age as Houdini. His magic was mostly old school presented in a modern way. He didn't dress like a magician nor did he act like any magician that modern audiences had seen. He was young and vibrant and most of all enthusiastic about his art. He constantly said words like 'wonder and illusion' like they were candy and they became synonymous with him. Even though he did tricks for a living, Doug always seemed to believe there was real magic out there, somewhere. An incident that happened to him in 1971 appears to be a turning point in his career. He was booked to perform in an area several hundred miles from the North Pole. It was a tour for the Canadian Armed Forces who were stationed in the frigid arctic region. During the tour Doug also did a show for a group of Eskimos. Who didn't respond at all during or after his show. No clapping or laughing or anything. They paid attention but gave none of the usual reactions that Doug was used to getting from his magic. That was Doug's mission after that, to bring 'wonder and magic' to the world. He inspired so many of us that are around today. Now in the 21st Century, magic has changed a lot. Attitudes and styles and techniques have evolved. 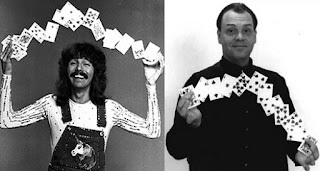 Doug's magic seems a little dated by today's standards, yet the real magic of Doug Henning had nothing to do with the tricks, it was the man himself. Oh, and in case you're wondering if Doug had any influence on me, take a look at the photo below. *I found this story on the Magicpedia page on Doug Henning. It's very possibly from the book by John Harrison, but I don't have that handy to check it.